Maintains only a single instance of a running application at a time. If another instance is started, it will determine (via DCOP) whether it is the first instance or a second instance. If it is a second instance, it will forward on the information to the first instance and then quit. If your application is used to open files, it should also support the --tempfile option (see KCmdLineArgs::addTempFileOption()), to delete tempfiles after use. Add X-KDE-HasTempFileOption=true to the .desktop file to indicate this. Definition at line 48 of file kuniqueapplication.h. allowStyles Set to false to disable the loading on plugin based styles. This is only useful to applications that do not display a GUI normally. If you do create an application with allowStyles set to false it normally runs in the background but under special circumstances displays widgets. Call KApplication::enableStyles() before displaying any widgets. GUIenabled Set to false to disable all GUI stuff. This implies no styles either. configUnique If true, the uniqueness of the application will depend on the value of the "MultipleInstances" key in the "KDE" group of the application config file. Definition at line 317 of file kuniqueapplication.cpp. Definition at line 348 of file kuniqueapplication.cpp. Adds command line options specific for KUniqueApplication. Should be called before calling KUniqueApplication constructor and / or start(). Definition at line 87 of file kuniqueapplication.cpp. Creates a new "instance" of the application. Usually this will involve making some calls into the GUI portion of your application asking for a new window to be created, possibly with some data already loaded based on the arguments received. Command line arguments have been passed to KCmdLineArgs before this function is called and can be checked in the usual way. The default implementation ensures the mainwindow of the already running instance is shown and activated if necessary. You should prefer using it from your overridden method instead of doing it directly. Note that newInstance() is called also in the first started application process. An exit value. The calling process will exit with this value. Definition at line 466 of file kuniqueapplication.cpp. Dispatches any incoming DCOP message for a new instance. If it is not a request for a new instance, return false. Overloaded from DCOPObject to make sure that the application stays unique. Definition at line 393 of file kuniqueapplication.cpp. Returns whether newInstance() is being called while session restoration is in progress. Definition at line 461 of file kuniqueapplication.cpp. Definition at line 486 of file kuniqueapplication.cpp. Forks and registers with dcop. The command line arguments are being sent via DCOP to newInstance() and will be received once the application enters the event loop. Note that it's not necessary to call start() explicitly. It will be called automatically before creating KUniqueApplication if it hasn't been called yet, without any performance impact. true if registration is successful. false if another process was already running. 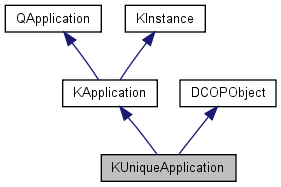 Definition at line 93 of file kuniqueapplication.cpp. Definition at line 491 of file kuniqueapplication.cpp. This website is maintained by Adriaan de Groot and Allen Winter.